Imbe, which has the scientific name Garcinia livingstoneii and which is a member of the Clusiaceae family, is also called by the names mmimbi, African mangosteen, Afrika-geelmelkhout, mokongono, mokononga, umGobandlovu, and umPhimbi. It is a small tree that reaches a height of 10 to 20 feet, is endemic to east Africa, and has thick, woody branches and yellow to red resin. Imbe thrives on deep and sandy soils but also can tolerate salty soil, so they can grow near the ocean. The tree of the imbe has long been known to serve an important purpose in traditional medicine, with its roots used as a natural aphrodisiac. The wood of the imbe tree is vulnerable to borers, or insects or insect larvae that eat at wood. Imbe is cultivated commercially for its fruits. Each one of them has a single large seed. The fruits have a watery pulp, taste sweet – having a flavor much like that of the apricot – but are very acidic, and contain latex. Measuring about three to seven centimeters in diameter, they are usually grown for display and to satisfy people’s ornamental cravings, as they look good in a fruit basket, but sometimes they are consumed. 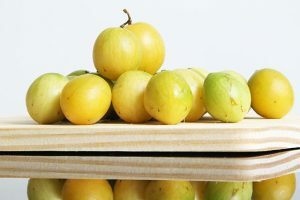 Imbe fruits can be found in the markets between the months of June and October, but ripen mostly during the month of August. They are slightly bigger than another kind of mangosteen, which is the lemondrop mangosteen (Garcinia madruno) that measure two to four cm in diameter and are native to the Malayan peninsula. The juice of the fruits can cause stains that are hard to get out. Imbe has antioxidant properties. It prevents cell damage by harmful free radicals, thereby delaying the onset of aging, making the body resistant against infection and disease, and protecting organs and tissues from deterioration, especially the various body systems and the body’s mental function. Imbe is good for weight-watchers. Its rich fiber content allows for a higher metabolism rate, thereby making the fruit a perfect inclusion to your weight-loss plan. Imbe is good for the skin. Imbe has the power to lower and regulate blood cholesterol levels, boost the body’s vitality, and provide anti-inflammatory benefits, thereby making it a potent preventive fruit to ward off the onset of type-2 diabetes. Imbe is good for the immune system. Its high vitamin C content is responsible for the production of antibodies that fight disease-causing germs and bacteria. Also, the folate found in imbe contributes positively to the development of the fetus in the womb and the formation and regeneration of cells in the body. Imbe is good for the circulatory system. Imbe can be used to make pies, assorted desserts, and preserves. Imbe has antioxidant and anti-inflammatory properties. Imbe is good for weight-watchers.